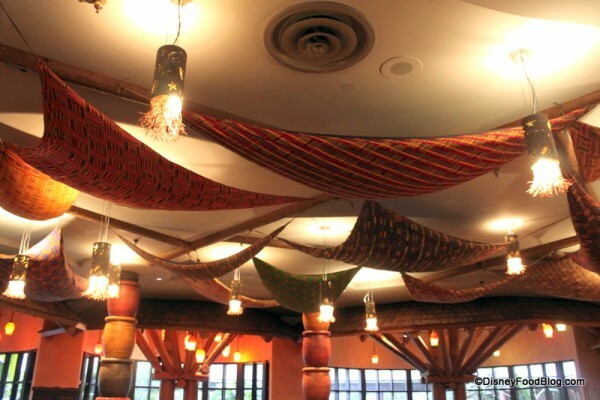 Ceilings are lined with large pieces of cloth strung up at the corners to mimic how shades would be created outdoors over the gathering place or marketplace. I just love this touch. Large tables featuring fre-form wooden tabletops and chunky hardwood chairs are ready for guests to arrive. Other tables feature an African fabric design and more delicate chairs. 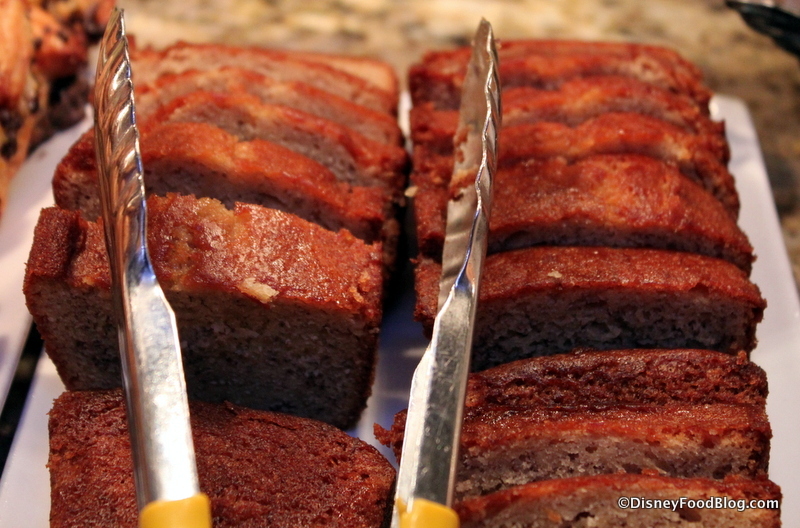 Don’t forget to look closely here for hidden Mickeys!! In this photo you can also see the thatched roof area over the buffet, as though food is served from shelters and seating is a gathering of tables in the open air under the fabric canopies. Some mixed seating is also available, with a few banquettes located in the part of the seating area furthest from the entryway. You can see another “boma” fashioned out of wood here, edging the half wall that separates the seating area from the buffet. And that brings us to the really important part of the morning. The food!!! 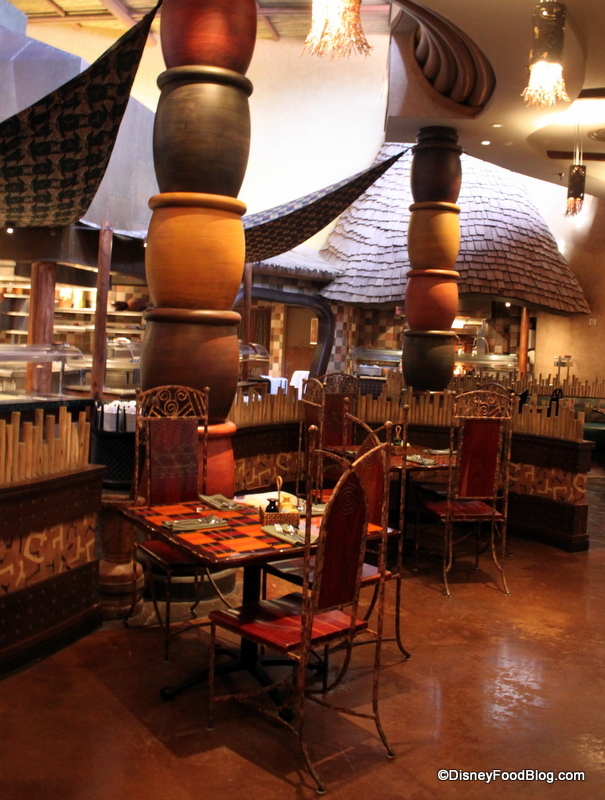 Your journey through the Flavors of Africa begins as your server greets you and takes your beverage order. I can definitely recommend the Jungle Juice! This is pretty much the unofficial beverage of Animal Kingdom, as it’s also served within the park at Tusker House Restaurant. And just for fun, be sure to check out a frozen version at the Harambe Popcorn Cart adjacent to Tusker House. 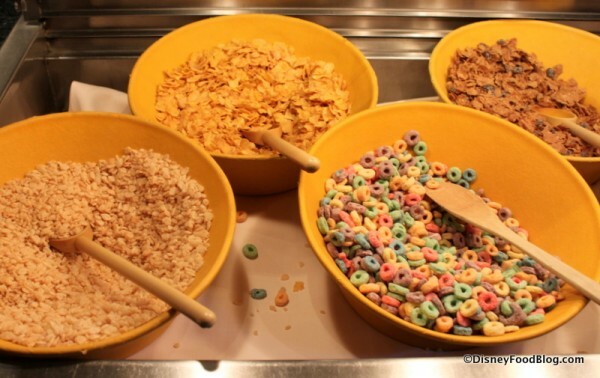 Once you’re settled in with your beverage, it’s time to hit the bountiful buffet. To make the review easier to follow, I’ve broken it up into sections. Let’s take a look! 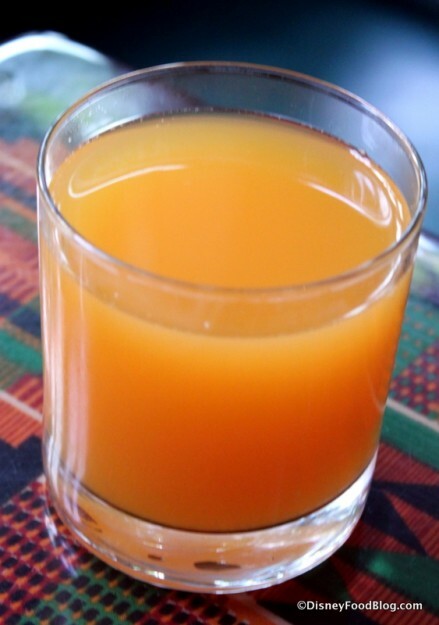 Start your morning off with a healthy kick. In addition to Fresh Fruit like Pineapple, Cantaloupe, and Grapes, the bar has Vanilla Yogurt. 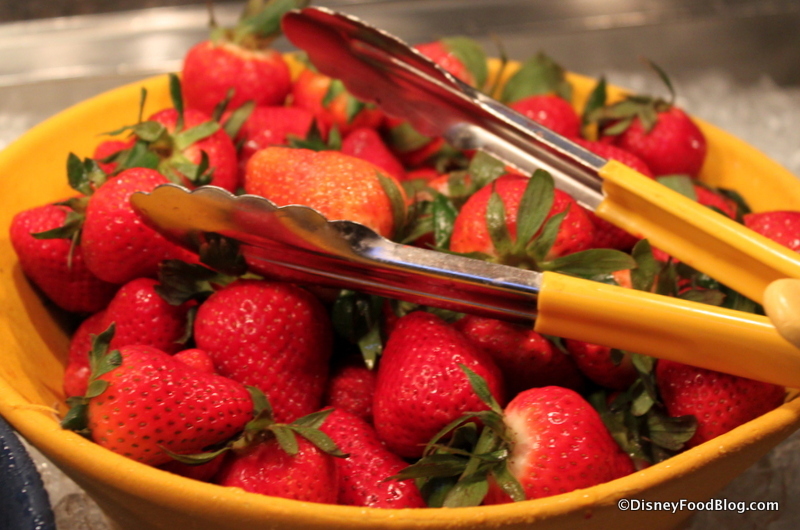 The morning I visited, there were also fresh Strawberries and Strawberry Banana Yogurt. While there aren’t a lot of salads to choose from, I did find this African Fruit Salad, which looks pretty interesting. 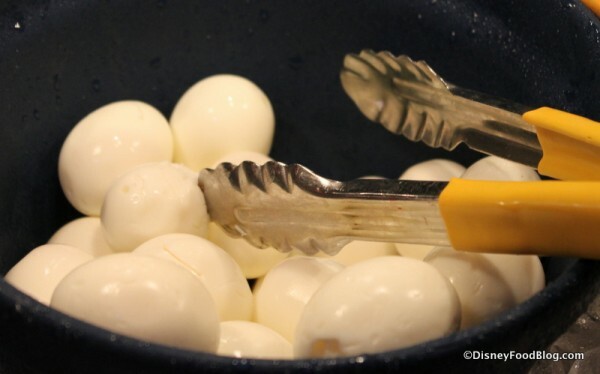 You’ll also find Hard Boiled Eggs here, perfect for a picky eater or an extra pop of protein. You’ll even find Granola here for sprinkling on your yogurt or into your oatmeal. 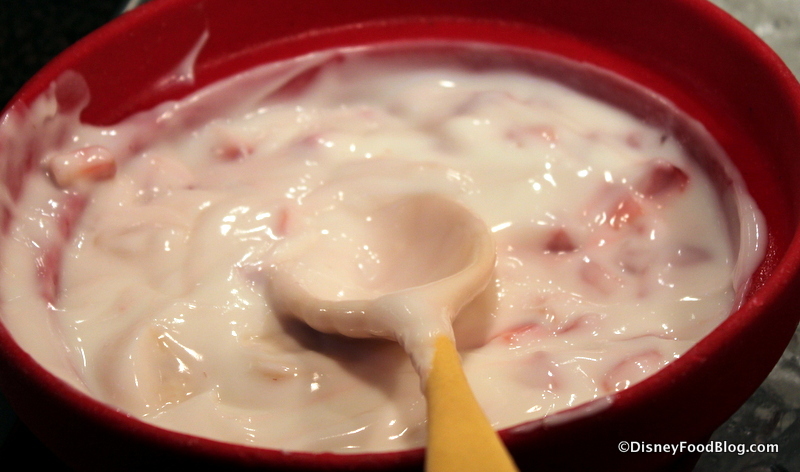 And speaking of Oatmeal, here you go! Complete with Brown Sugar, Raisins, and Cinnamon. 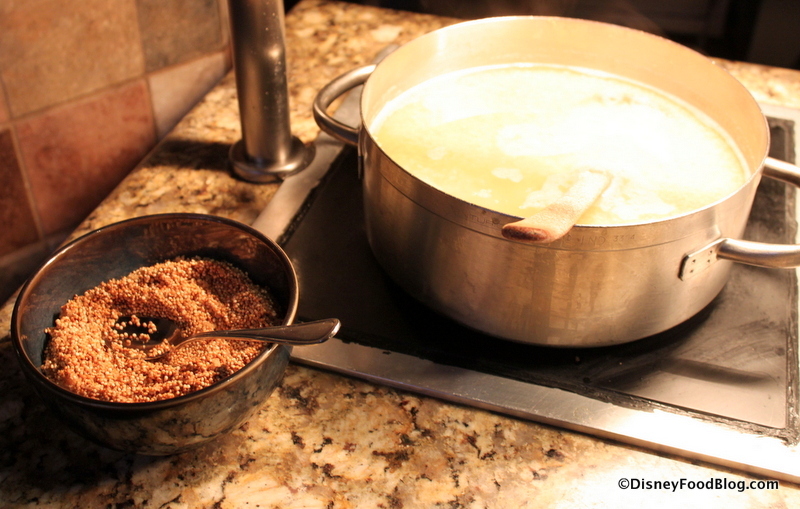 There’s also Quinoa Porridge for those who prefer this hot grain. 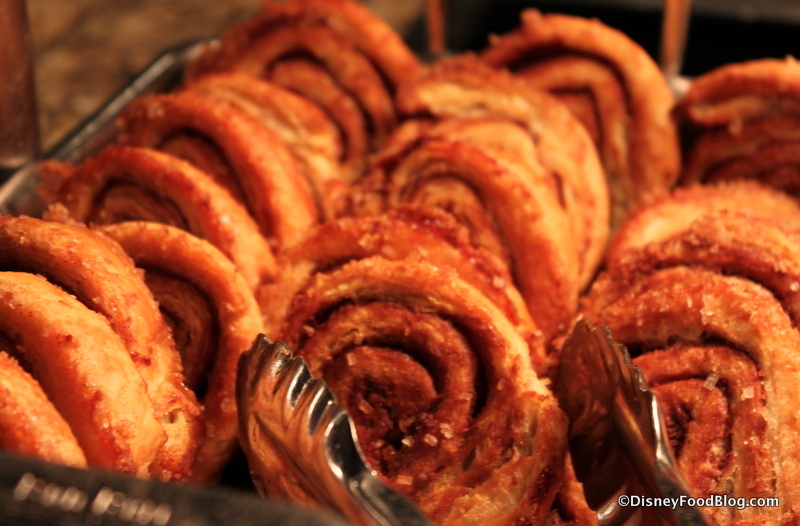 Fans of Boma breakfast really appreciate the wide array of breakfast breads and pastries that are available each morning. There’s almost always a moist and delicious Banana Bread. 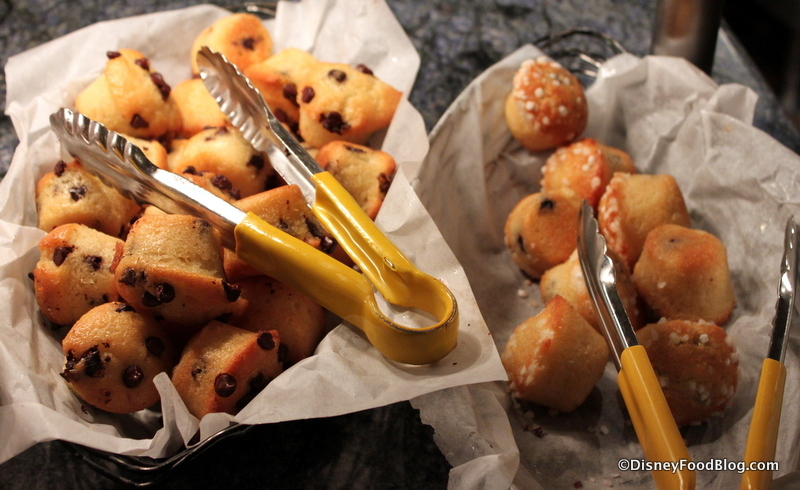 I also think the little Mini Muffins are such a great idea. They’re the perfect size to try more than one flavor! The Orange Bran Muffins sounded pretty awesome. 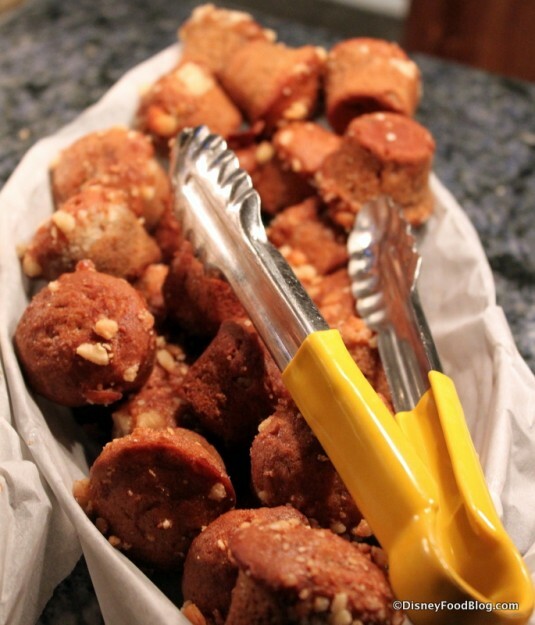 The Macadamia Nuts that garnish these Banana Muffins are a nice touch. Chocolate Chip and Blueberry Muffins are sure to please just about everyone. 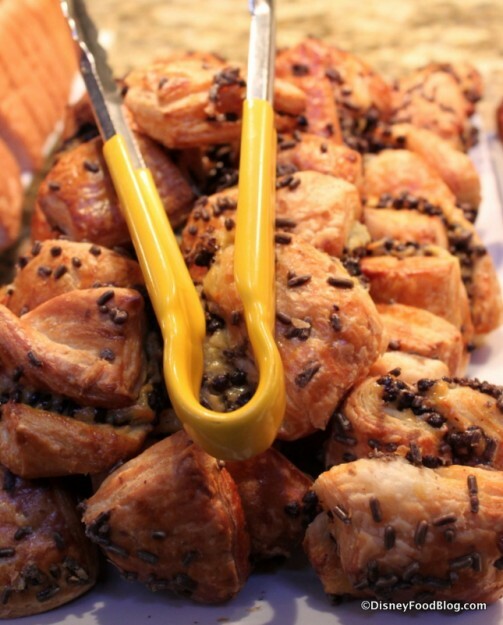 Next come the pastries, fresh baked daily. 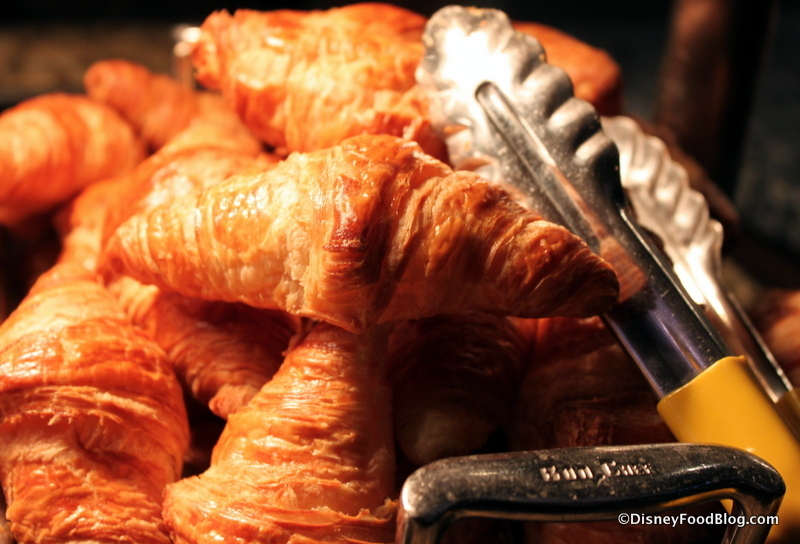 The Miniature Croissants are gorgeous! Cinnamon Rolls look rich and buttery, but I miss that healthy (and by healthy I mean plentiful, of course) dose of icing that makes them irresistible. This is also one of the few breakfast buffets that I’ve seen feature Scones — also in a miniature version. The Sticky Buns look rich, enrobed in a Caramel Sauce and topped with pecans. 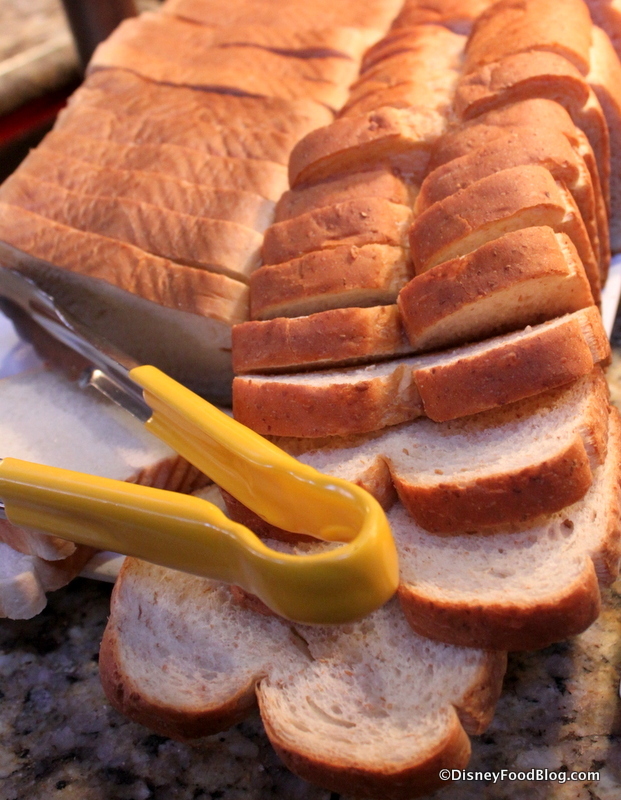 Toastable breads are available if you’d prefer — like Bagels and White Bread. 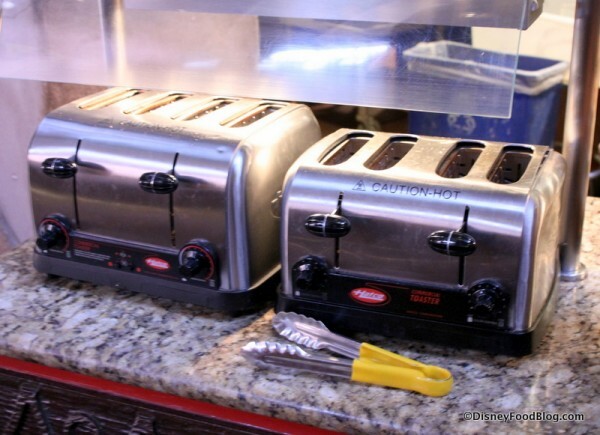 And of course, there are toasters on stand-by, too! 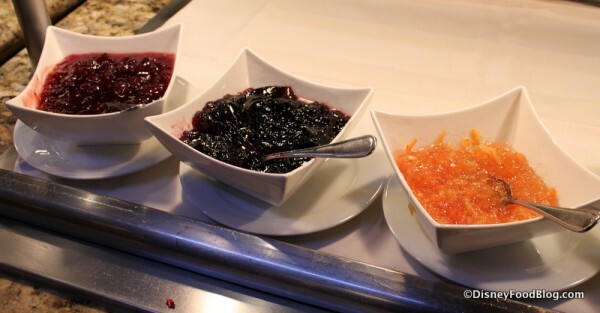 You’ll also find all kinds of bread spreads, including Cream Cheese, Butter, Jams, and Jellies. Another favorite feature of Boma breakfast is the Create Your Own Omelet Station. 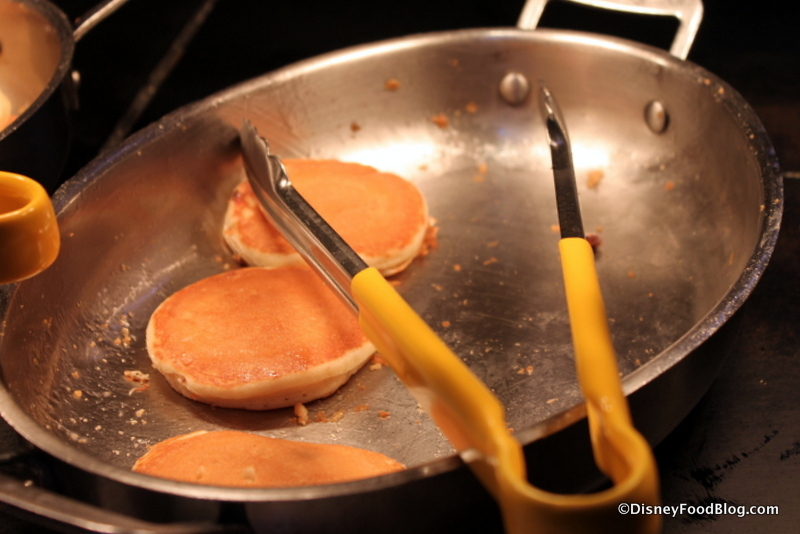 Choose your fillings and watch while a cast member whips them into a delicious breakfast dish! I didn’t see any meats among the options here (maybe I just missed it? ), but there are a couple of cheeses and some tasty vegetables to dress up your eggs. There are many other sides and main dishes that you can choose from. 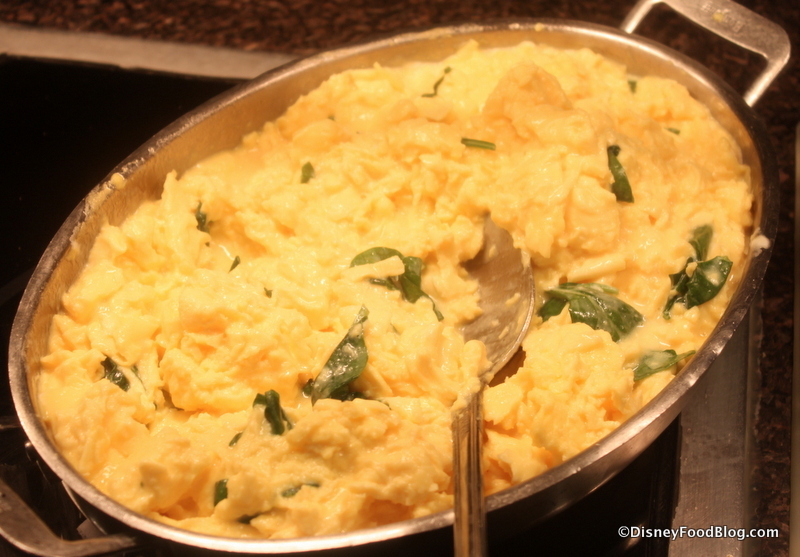 Start with two kinds of Scrambled Eggs. The day we visited, we enjoyed the choice between Plain and Eggs with Goat Cheese and Spinach. 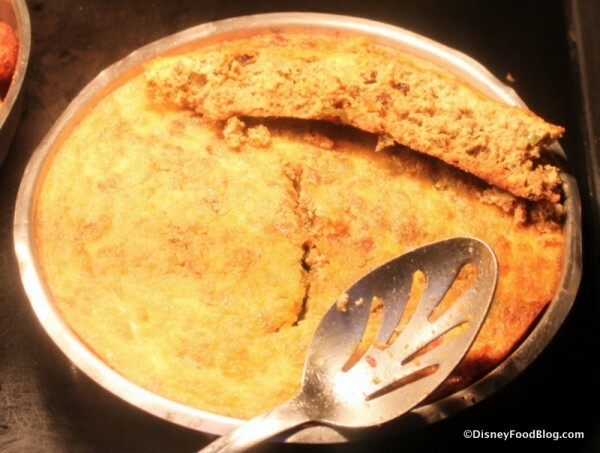 Many of my favorite African-inspired dishes at Boma appears on both the breakfast and dinner menu — a daily special version of Bobotie. 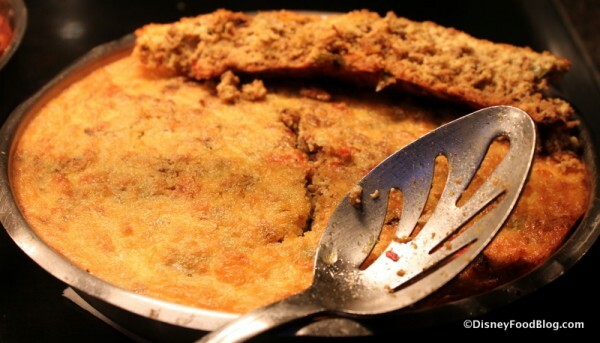 Similar to a bready, crustless omelet, the dish was made with Turkey for this visit. 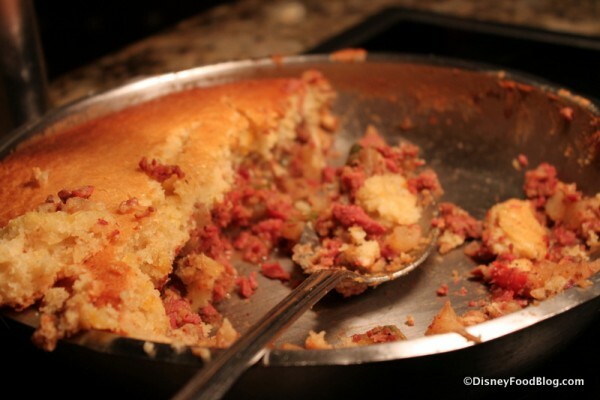 African-Spiced Corned Beef Hash lends some exotic flavor to a favorite breakfast dish. Sausage and Bacon are also available. 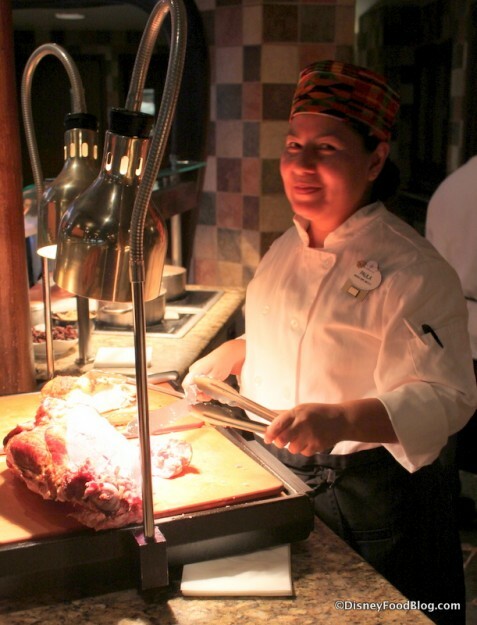 Just like at dinner, you’ll also find a Carving Station featuring meats that are spit-roasted over an open fire. 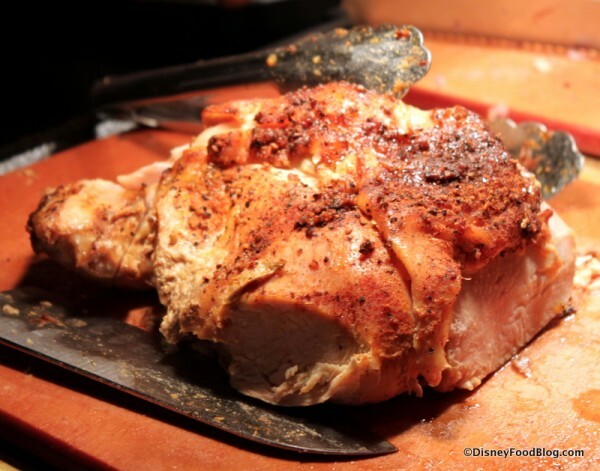 We could choose from Roasted Turkey Breast or Ham. Cast members carve the meats right before you, ensuring your portion is freshly cut. 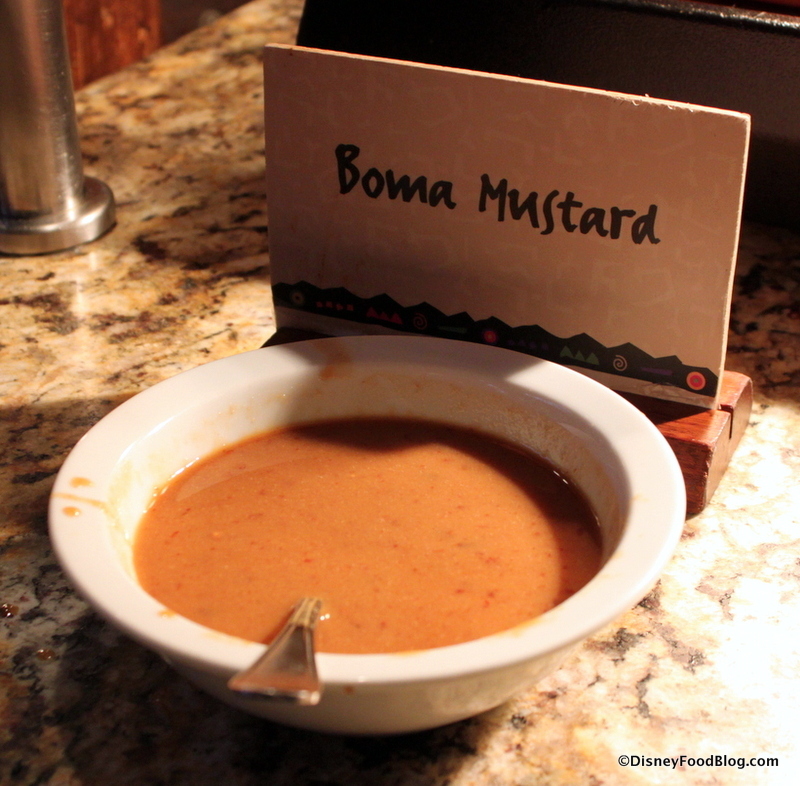 And those awesome sauces are available too, like Boma Mustard and Sambal, one of my favorites! The spicy chili condiment will brighten up any meat in a flash! 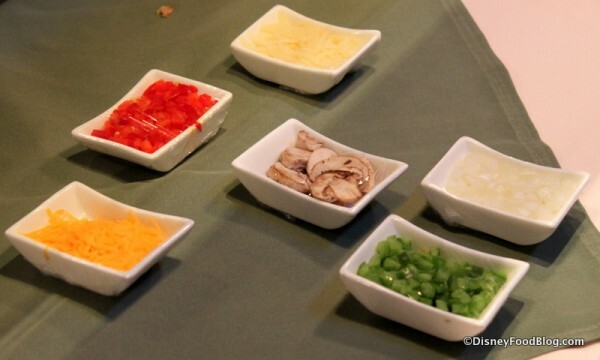 To complement the main dishes, there are also a wide range of Side Dishes. We enjoyed Asparagus during our Boma breakfast. In lieu of American grits, you’ll find Pap on the menu here. Similar to grits, I think they’re a little softer and finer than their American southern-comfort-food counterpart. 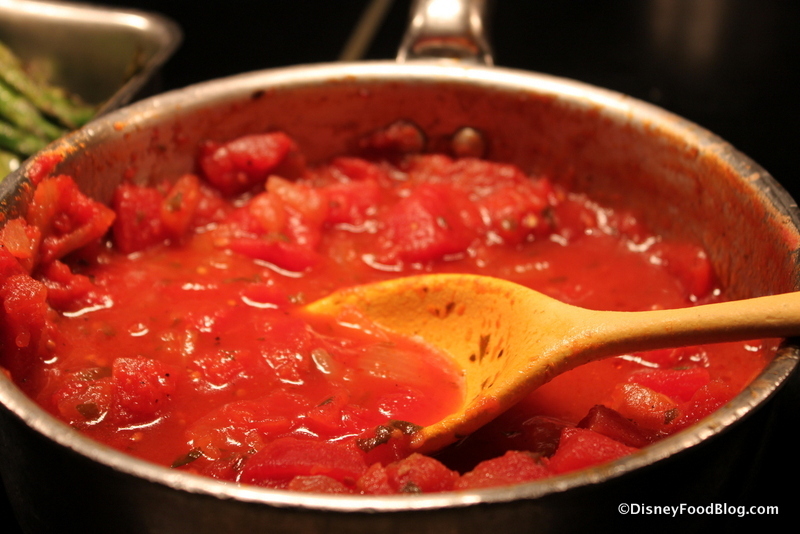 Normally, the pap is paired with Chakalaka, a flavorful tomato stew. However there are also Grilled Tomatoes, which are halved and broiled with cheese on top. The Breakfast Potatoes at Boma are out of the this world! Be sure to make a little room on your plate for some. 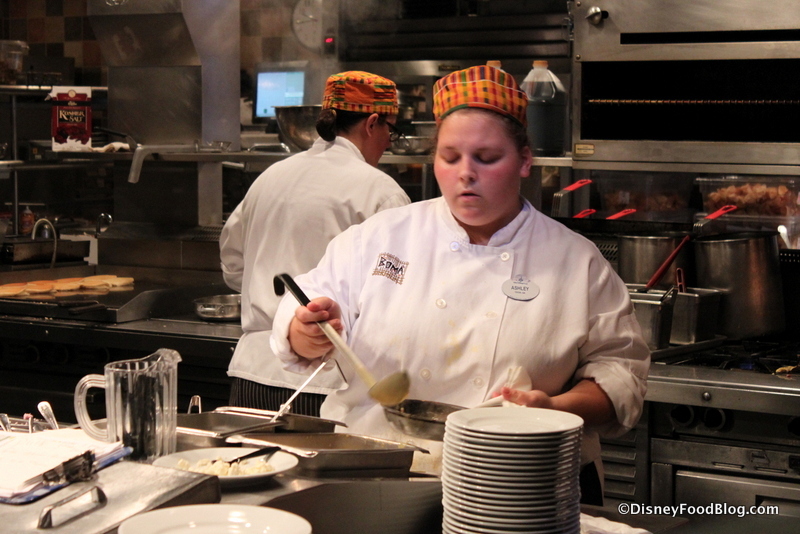 Kitchen staff stay busy, cooking more food and replenishing supplies of all the dishes in full view of the guests. 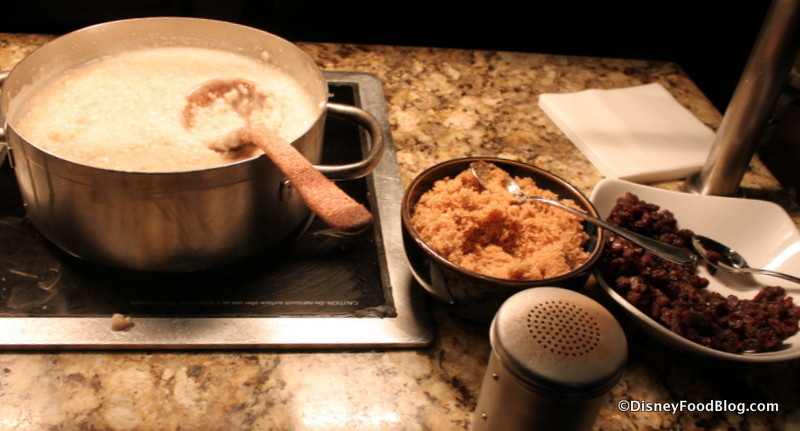 You can also enjoy a number of different sweet dishes at Boma. 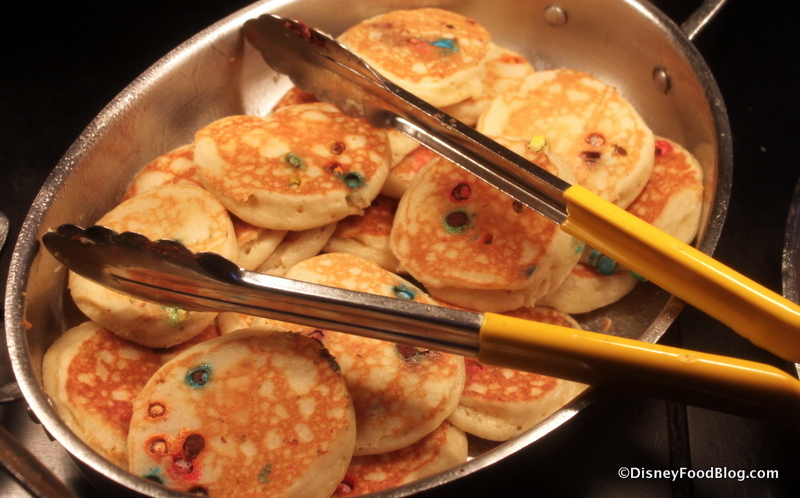 I love the fun M&M Pancakes on the Kids’ Buffet! 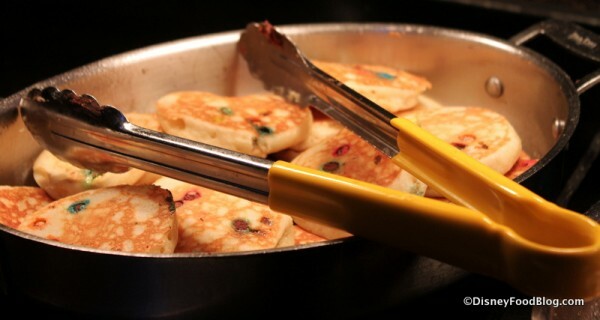 Of course, you’ll also find a plain version of Pancakes, too. And there’s plenty of warm syrup to go with them. You can also get thick Waffles at Boma. 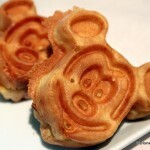 But here’s a surprising fact: they aren’t Mickey Waffles! (Gasp!) But they’re still pretty delicious. 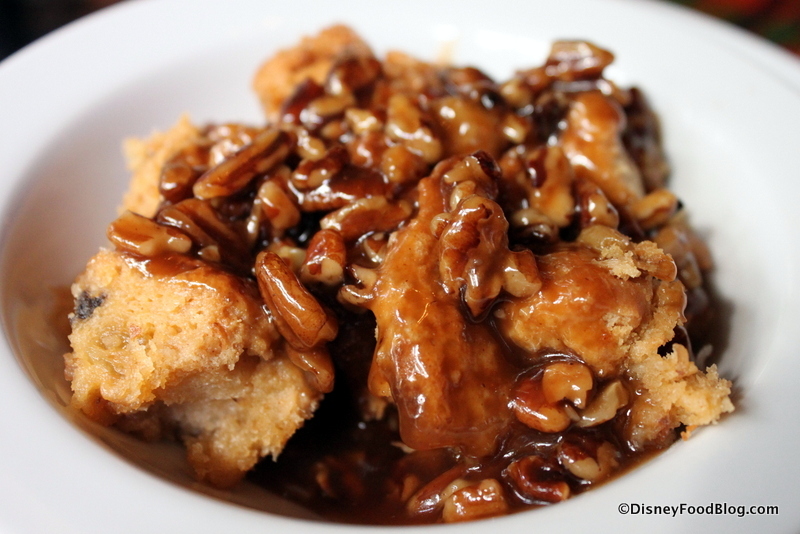 And while you won’t find french toast, you will find French Toast Bread Pudding — complete with Pecan Praline Sauce. In fact, I decided to cap off my delicious breakfast with this dessert. It was completely fabulous. And after all, it’s vacation, right? And dessert after breakfast is practically required! Boma is at once familiar and exotic. 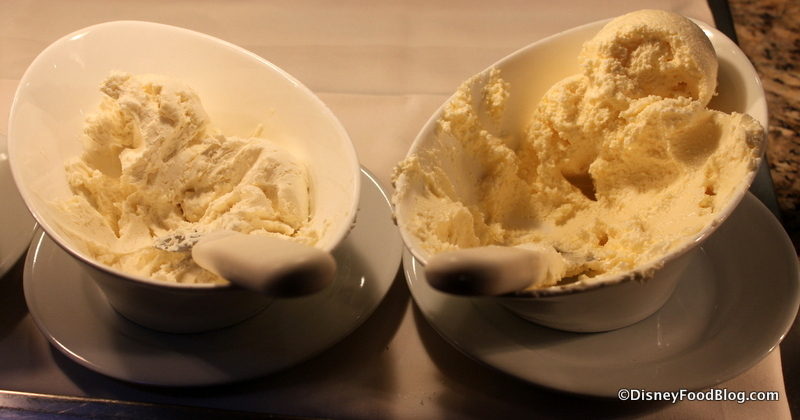 There are certainly enough traditional foods that everyone should find something they like. But I love that they also include a few of the quintessential African dishes, like bobotie and pap, on the breakfast spread so that everyone can enjoy them. While some guests might wish there were a character or two peeking around the corner, or a raucous celebration with loud music, others will certainly enjoy the more peaceful atmosphere. With delicious dishes and a beautiful setting, I can definitely recommend Boma for breakfast. It’s a great way to kick off your day before heading out to your next adventure! 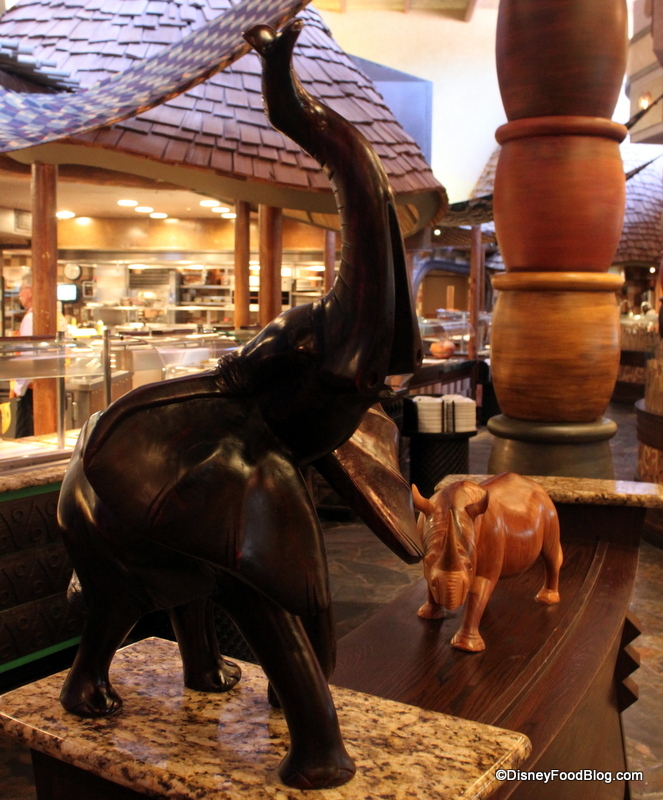 Is Boma one of your favorites? 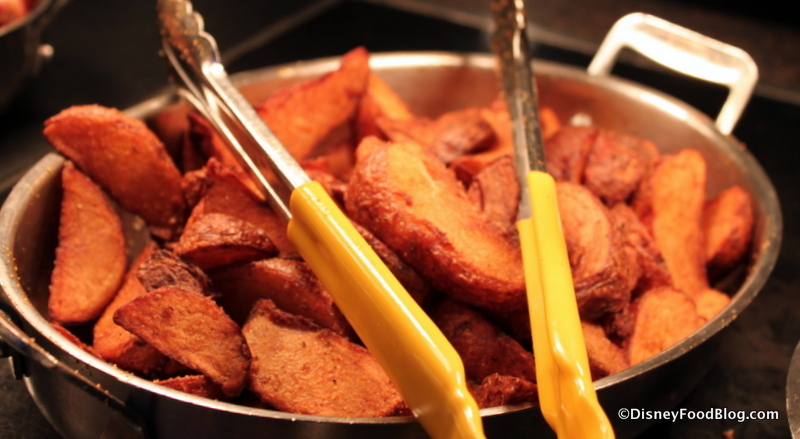 Leave us a comment and tell us about your favorite dishes! These pictures and review are a terrible thing to see when I am about to have my breakfast of cherrios and skim milk. What I would do for some of that French toast bread pudding and praline sauce. I guess I will go wild and slice a banana onto my cereal. 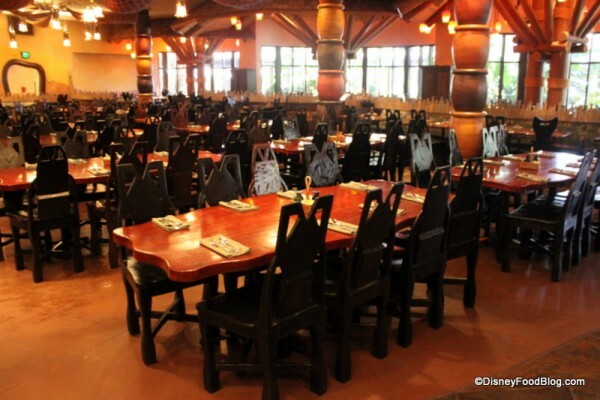 We really enjoyed Boma on our last trip. Your review describes it perfectly! Our waiter did mention, since Boma has a working kitchen, you can order mickey waffles and omlettes made-to-order. They were delish! It may help to ask. Chackalacka, pap and turkey are my favorites at Boma! 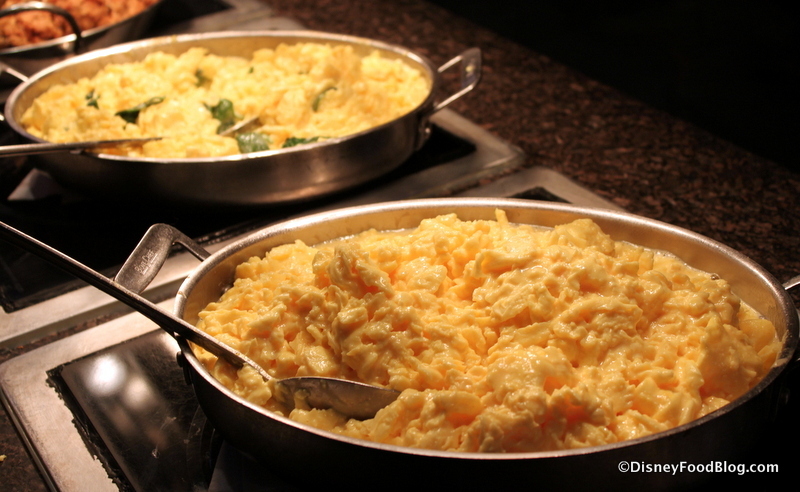 One question: the eggs on the buffet are usually too runny for me. Will they scramble them hard if I were to ask? I’ve never had the nerve to. I hate to be a downer, but while I was satisfied with my Boma breakfast back in May, I didn’t find it to be anything spectacular. 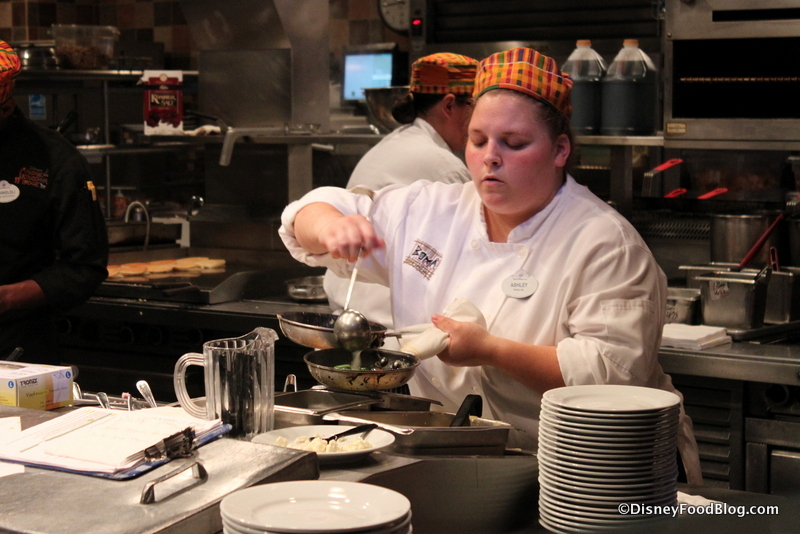 There are definitely some Boma specific highlights to the food, but I found the majority of items to be pre-packaged or frozen meals that were just heated up by the kitchen staff. Most of the food was something you could not only find at any other Disney breakfast buffets, but also on most any other of this country’s breakfast buffets. 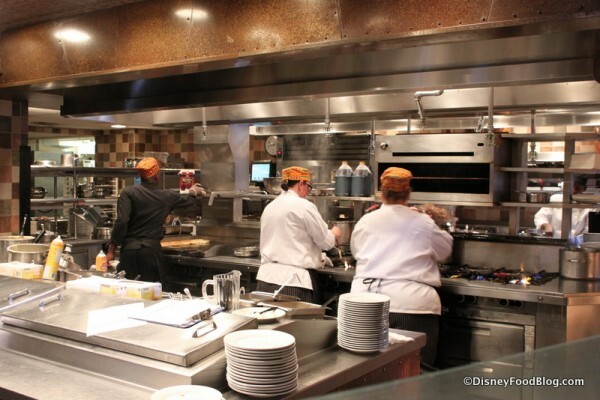 Some items that really bothered me were the items that SHOULD have been made fresh in-house, but instead are bought frozen and reheated at Boma. 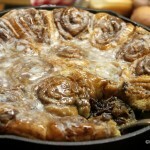 These would include the pancakes, muffins, croissants, and cinnamon buns to name a few. Don’t get me wrong, I LOVE Boma. I had dinner there before, and that really was amazing. 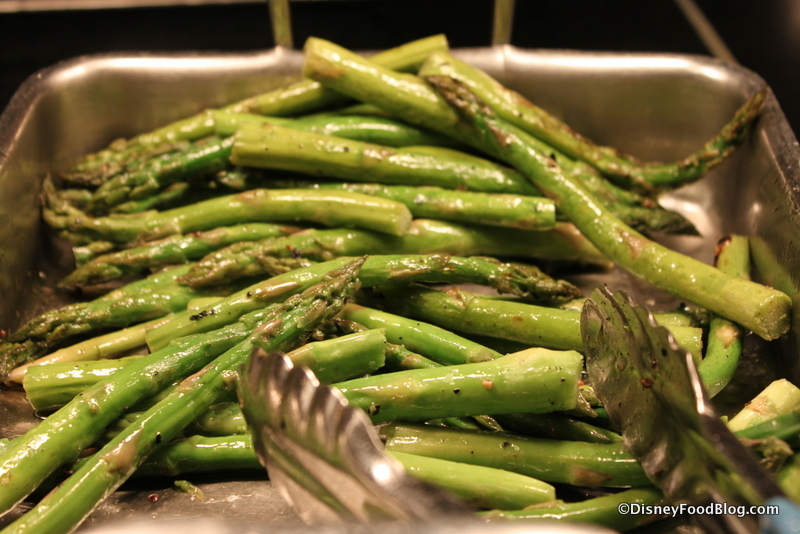 It was one of my favorite dinners at Disney so far. I do enjoy the breakfast there, I’m just saying I didn’t find it all that unique compared to anywhere else, other than a handful of particular foods. 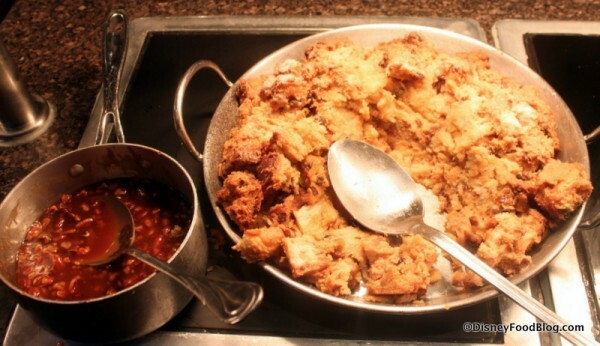 Love that French toast bread pudding! Trails End at Ft Wilderness has a very similar if not identical version and it is delicious!! 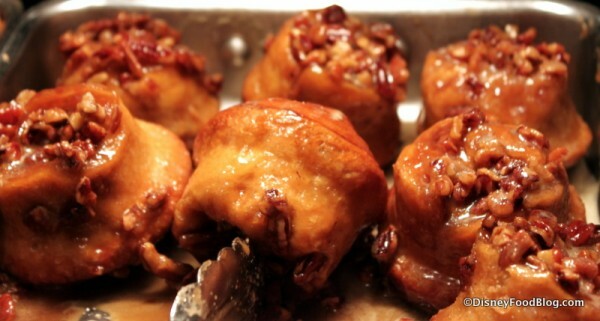 I agree Katie, that was one of the highlights for me, especially with the pecan praline sauce. Like Jeff, I have to say that although it’s one of our number one spots for dinner, we were a little disappointed with Boma’s breakfast offerings. There was a lot of choice but as Jeff has already mentioned, the vast majority of buffet items weren’t ‘exclusive’ or even ‘unusual’ and we came away rather wishing we’d gone back to the Wave for a breakfast buffet again. Usually our must do on the last day of our vacation. now it is an orange juice blend. NOT good. When my husband and I had the breakfast buffet at Boma, I was sad to see that they did not have zebra domes out at breakfast. 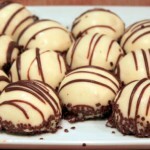 When our waiter overheard me saying that I was going to have to go buy some at the Mara, he brought me a plate of freshly made zebra domes from the kitchen for my husband and I to share…. mmmm!!! 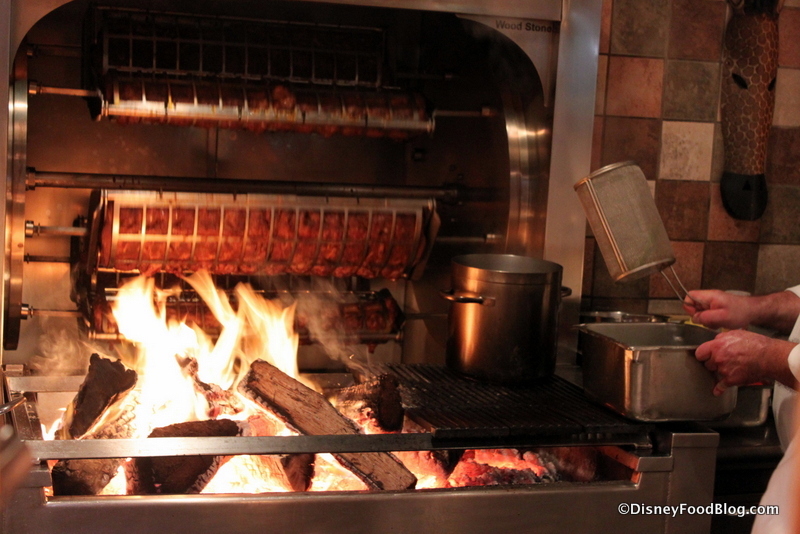 Boma is one of my favorite restaurants in Disney World. How exciting to hear that they have a new brunch option! That Quinoa porridge sounds right up my alley! First, I agree with everything in your review and the pictures are great. But I just can’t get behind Boma as a whole. 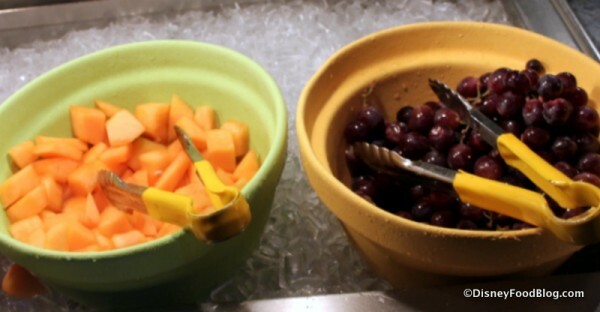 About a third of their offerings for breakfast can be found at the Hampton Inn’s free breakfast, not that I’m condoning staying off-site. While my wife and son are talking about how great the juice is, I’m thinking, “I just spent $70.00 for breakfast”. You know me; I don’t hesitate to spend $200 for dinner at Citricos or Flying Fish but Boma’s not for me. I’ll make Jungle Juice at home when the family complains enough. 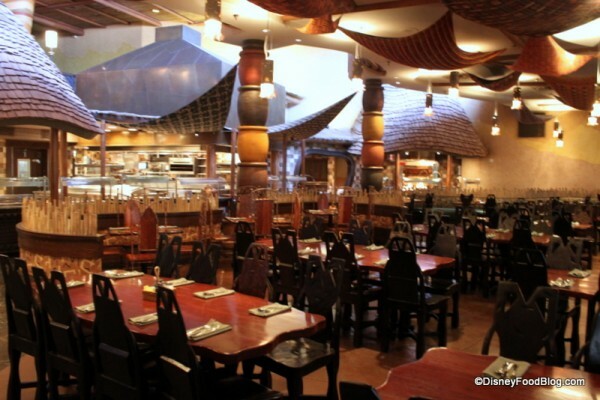 Boma looks and sounds fantastic! 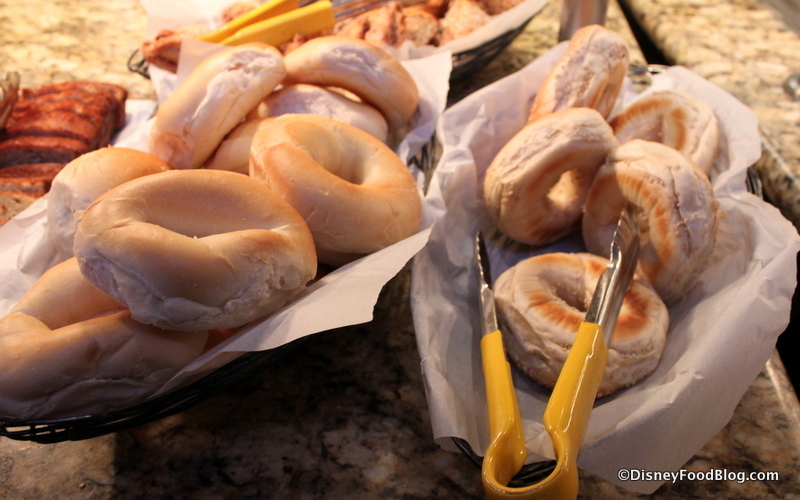 I like how the food varies when you compare it to other breakfasts at WDW. 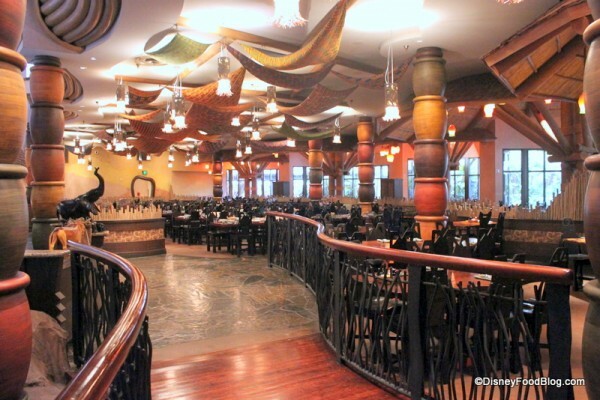 I’ve always wanted to eat at Boma and this review has made me want to book an ADR right now lol. We used to live in Africa, and we frequently ate quinoa porridge, so that’s, at least, another authentic taste of the continent. I’m not a breakfast person but my husband is. 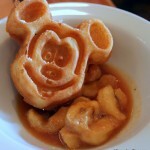 We ate breakfast at Boma twice last week and it was absolutely delicious! They had something for everyone! 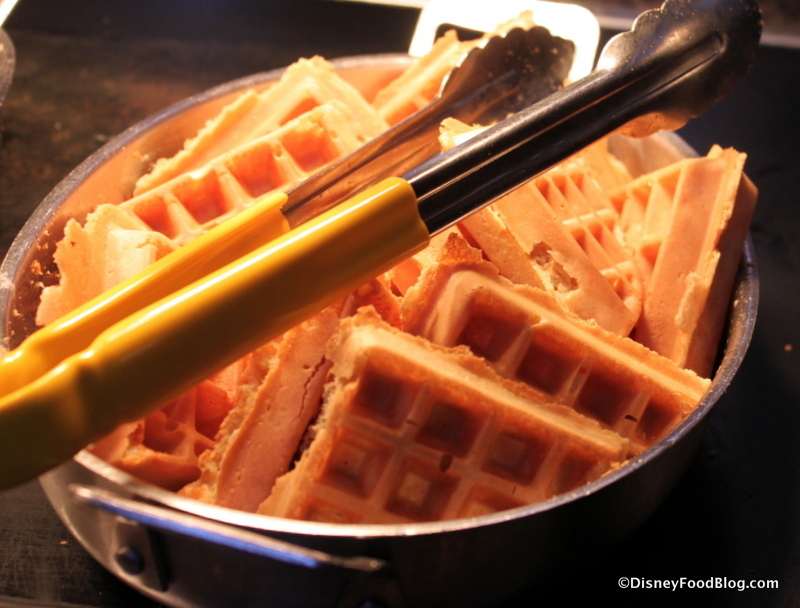 Loved the waffles with the pecan praline topping. 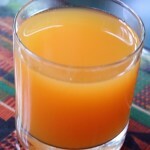 I never drink orange juice but downed 3 glasses of the jungle juice. Awesome meal! I’ve never even visited the AKL, but boy does that pecan praline sauce look wonderful. Is there any chance of getting the recipe for that? 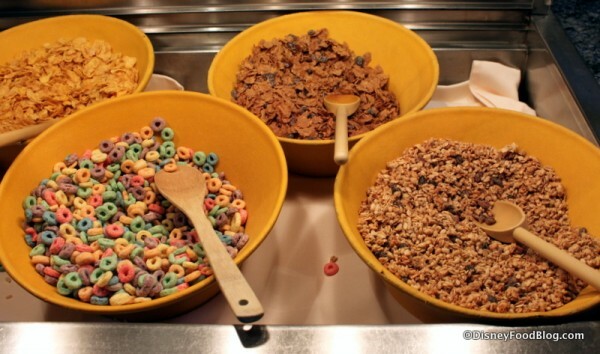 I loved this breakfast on our last stay (December 2012). We had the deluxe dining plan (3TS meals and 3 snacks per person per day =way too much food). This was one of our favorite late breakfasts our reservation was at 10:30 (we went to Animal Kingdom for Expedition Everest/Kilimanjaro Safari’s) easy transfer from Animal Kingdom to Animal Kingdom Lodge and back. I highly recommend transferring from the parks to a close resort – it is a nice break. It was so nice and QUIET such a great break from the busyness of the parks or buffet breakfasts with characters, especially because our party was 3 adults. 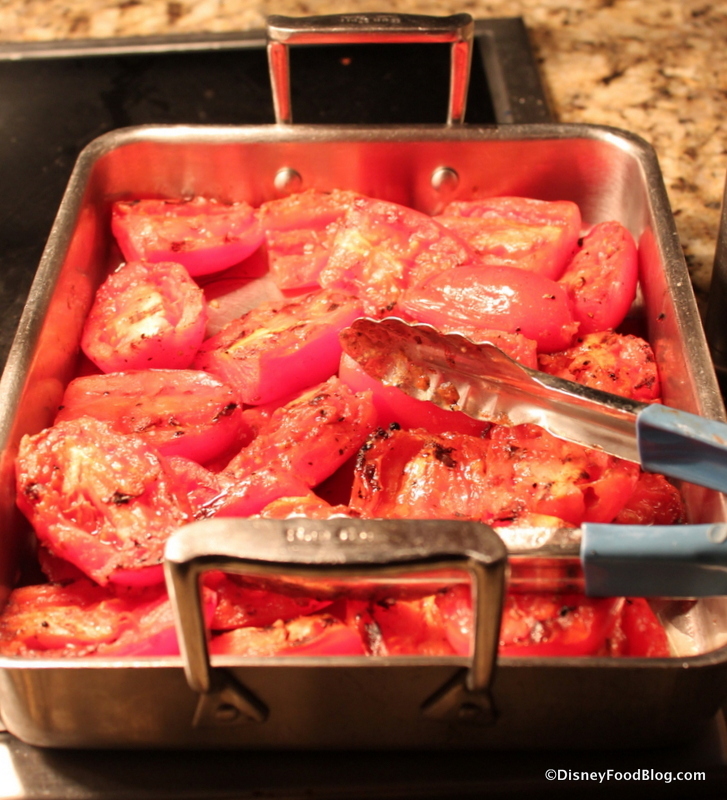 I was quite impressed with the hand carved meats, the asparagus and grilled tomatoes. I have never seen that on another buffet in WDW. 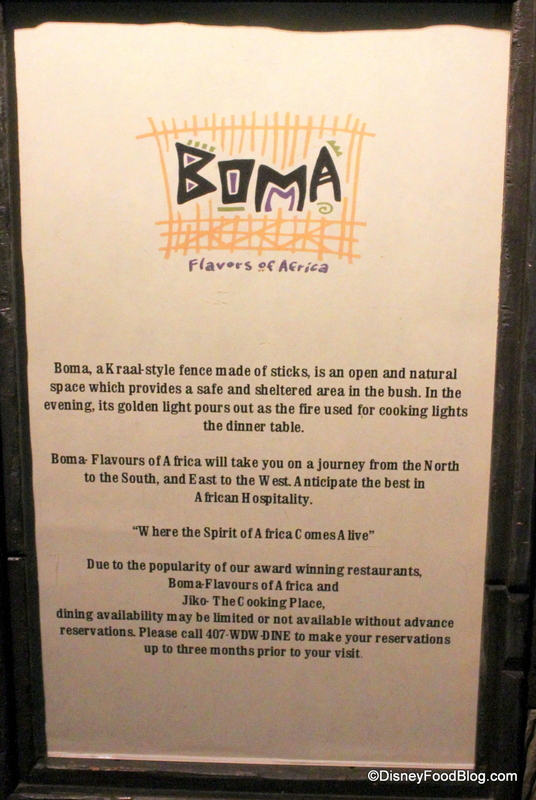 I have never had Boma at dinner and look forward to trying it on our next trip (planned for October 2014). I enjoyed dinner at the Wave and also look forward to having breakfast there as Rune mentioned. 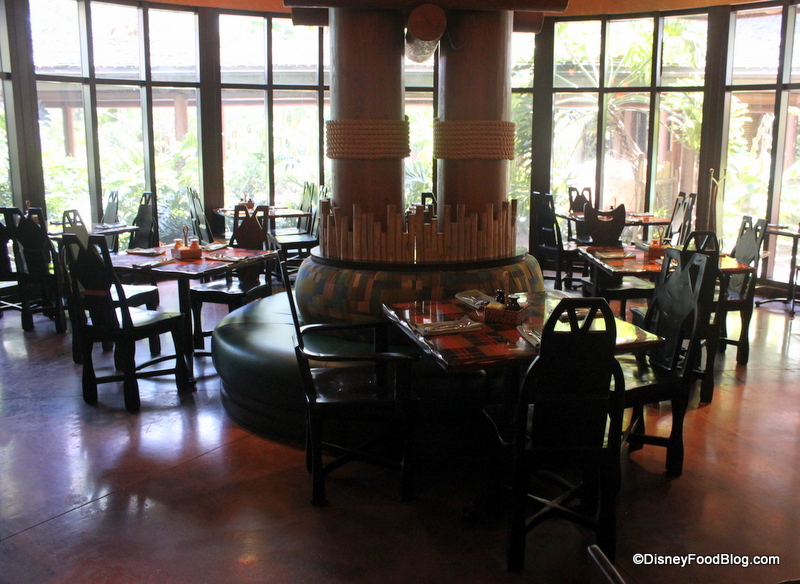 I love the ambience at Boma and the staff is terrific. FYI they have also switched to serving Joffrey’s coffee instead of Nescafe. 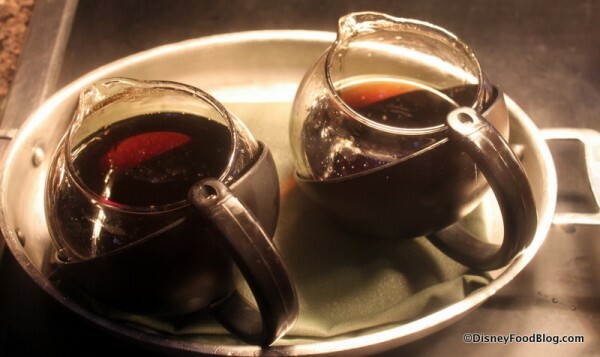 And if you like press pot coffee you can order that too, for an extra charge. We were there this past July at the end of breakfast hour (around 11:00) and the bread pudding had already been taken off of the buffet. We asked about it and they made sure they put out a fresh pan for us AND came over and gave us the recipe. A Disney magical moment- it made our trip 🙂 And a shout out for mealy pap- I love that stuff! I put cinnamon, raisins and cream on it. 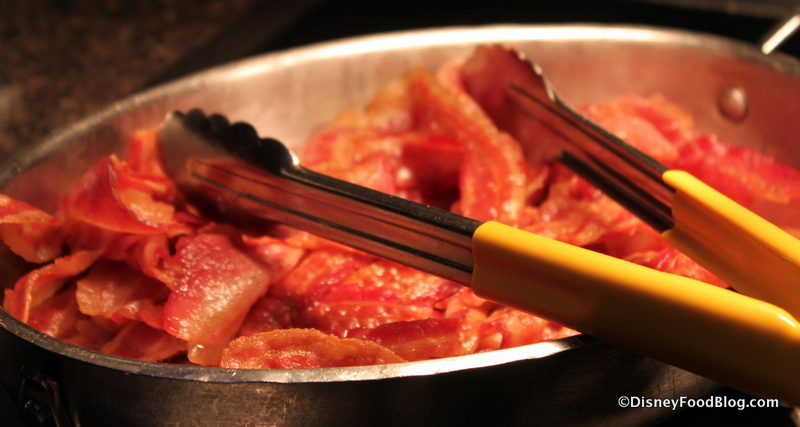 Count me as another Boma breakfast lover. I like that they have a balance of foods so that everyone at the table can get something they like for breakfast and hopefully try something new. Hand Carved meats and a bowl of fruit loops never does my day wrong. 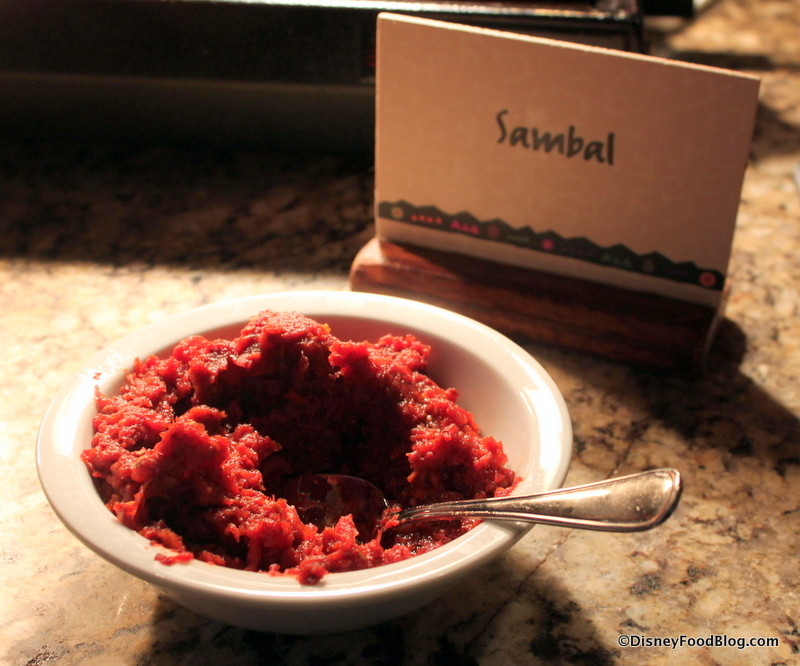 Is the African fruit salad the same as the “Fruit Fool” that Boma serves for dinner? If so, its delicious! I even searched for the recipe online. 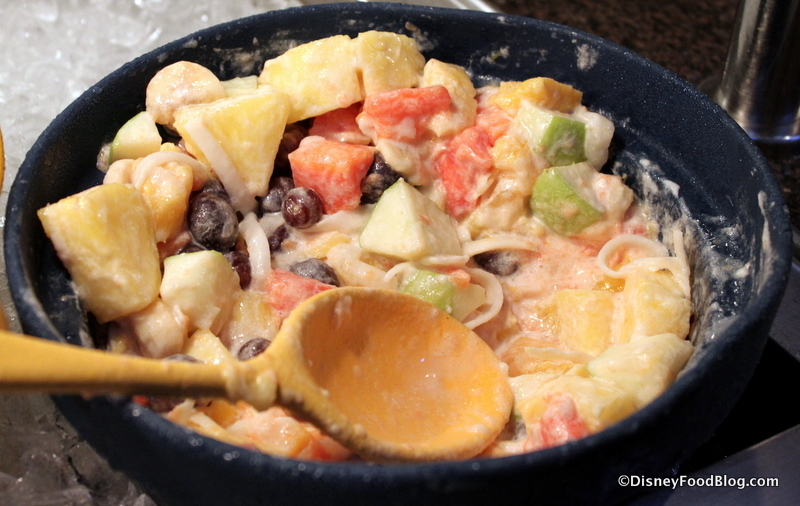 The African fruit salad consists of banana, pineapple, honeydew melon, cantaloupe, red grapes, mango, papaya, coconut strips (and possibly other fruit-that’s all I can remember right now 😉 ) with a creamy coconut dressing- not too sweet. Absolutely loved the breakfast potatoes. Do they have cinnamon? The posted recipe lists curry, garlic, and paprika but no cinnamon. 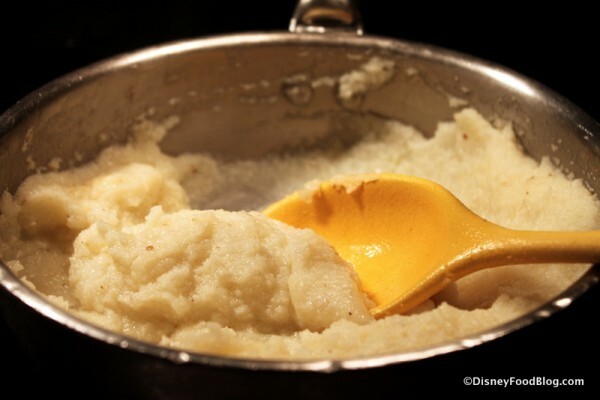 Can Boma share recipe? 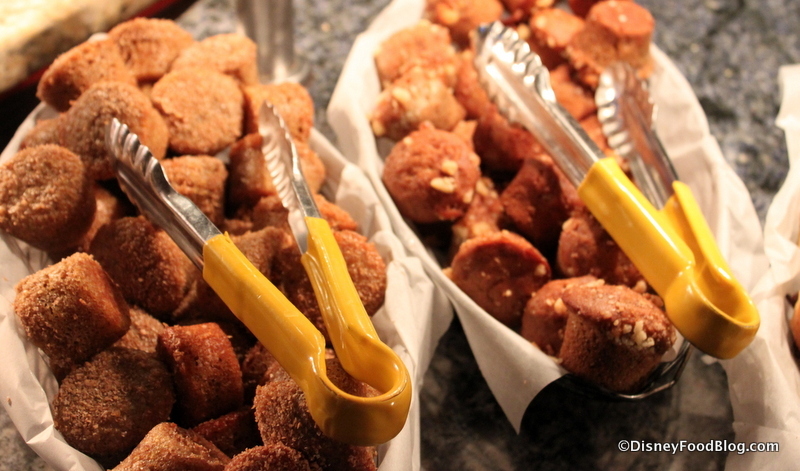 The French toast bread pudding w the caramel praline sauce was to die for!!! Wish I could find the recipe!!! Do they serve any adult beverages for breakfast, mimosas or jungle juice w rum? Tootie, there aren’t any alcoholic beverages on the menu currently, but with alcohol now being available on the Disney Dining Plan, it’s something to watch.